Lacquer or Leave Her! : BeautyBigBang Holographic Polishes! Oooh so pretty! I do like the jelly finish holos! These are so pretty! 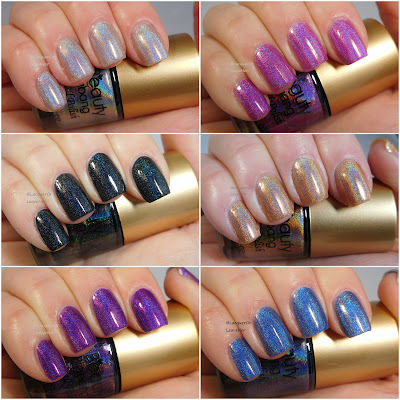 I love holos in any and every formula. Oh wow! I really like the purple! These are all so bright and vivid! Wow! I think I need to pick a few of these up. The last one looks like a good substitute for DS Glamour. These are fun! I was sent 4 but two were the same, LOL. I’ll have to use them ASAP! Sorry, That's because I have a typo in it! It should be MISHKA824M, I was missing the H. I'm so sorry for the hassle! I'll fix it in the post, too, thanks for letting me know.